We have seen reports for a number of years on the F-35 being able to track and identify ballistic missiles from tactically significant ranges. In this context they are looking at boost phase intercept and it makes sense to use a stealth platform with advanced sensors and datalinks to operate IVO BM threat areas. If we looked at how the USAF hunted SCUDs in the first Gulf War and transplanted the F-35 into that construct it would be interested to see how many aircraft were required and the fewer number of sorties required. Additionally the ability to potentially intercept the missile in flight against just targeting the launcher on the ground ideally before but also after launch would be significant. 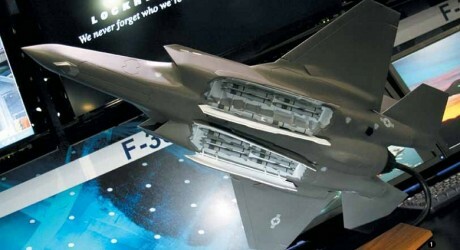 The US Air Force and Missile Defense Agency (MDA) are examining integrating the Lockheed Martin F-35 Lightning II into the US ballistic missile defense system. The stealth fighter’s abilities, especially its sensors, were highlighted as part of the Pentagon’s Missile Defense Review, released on 17 January, which stressed Russia, China, Iran and North Korea’s growing arsenal of cruise and ballistic missiles as a potential threat to US security. A joint report for integrating the F-35 into the US missile defence would be issued within the next six months, says the Pentagon. Adding the F-35 into US missile defenses is part of a larger plan to move anti-missile systems closer to threatening adversaries as potential conflict or launches arise. For example, surface-to-air missiles, such as the ground-based, Raytheon-made MIM-104 Patriot or Lockheed Martin-made Terminal High Altitude Area Defense (THAAD) systems, as well as the ship-based, Lockheed Martin-made Aegis Combat System, could be moved into position quickly in a crisis to strengthen the USA’s defense against rogue state missile threats, says the Defense Department. The Missile Defense Review also noted the potential uses of airborne lasers as a counter ballistic missile weapon. Using the F-35 as a platform for shooting lasers at launching ballistic missiles was not mentioned in the review, though the MDA’s Low-Power Laser Demonstrator programme was noted. In September, as part of that programme the agency awarded nearly $70 million in contracts to Lockheed Martin, Boeing and General Atomics Electromagnetic Systems to further develop airborne anti-ballistic missile lasers. That's rather interesting. I wonder why? Money. They got practical and admitted that in country assembly would cost them a fortune and have no real benefit. Haven't they already set up the facilities for the domestic production? Pretty sure they've already completed at least 1. But could be wrong. That would be a big waste of money. I can see how the premium to build them locally would be better off spent purchasing extra aircraft though. IIRC, the domestic built aircraft cost about $30m more. Not sure why DefenseNews has decided to run this story now. The news that Japan was going to import all the aircraft was released at the time of the announcement and on the previous page of this thread. The Japanese are shifting it to be the MRO facility, staffed by those trained to assemble. LM seems pretty confident they can make the delivery numbers given the 40% increase. They have only missed by a couple in one year so at the moment their delivery history is good. The only issue I see would be if US/Turkey went south and then it isn't LM's fault that that situation has arisen. When was the last time a fighter jet manufactured more than 130 in a year? Detailing last year's delivery total, Lockheed says a combined 54 aircraft were handed over to the US Air Force, US Marine Corps and US Navy, while 21 went to partner nations. The remaining 16 were shipped to Foreign Military Sales (FMS) programme customers. Lockheed has hailed its achievement of the 2018 delivery target as "demonstrating the F-35 enterprise's ability to ramp up to full-rate production". "Year-over-year, we have increased production, lowered costs, reduced build time, and improved quality and on-time deliveries," notes Greg Ulmer, the company's general manager of the F-35 programme. Flight Fleets Analyzer records a current active fleet of 352 F-35s, assigned to 10 nations. This total includes assets being used in support of initial operational test and evaluation, which are excluded from our annual World Air Forces directory listing. Our data shows that the US armed services account for 75% of the global F-35 fleet, with the USAF's inventory alone representing a 49% share. Between them, Australia, Israel, Italy, Japan, the Netherlands, Norway, South Korea, Turkey and the UK have received 88 F-35s. The leading international users so far are the UK (17), Norway (16) and Israel (14). Lockheed uses a further 13 test airframes in support of the programme: five short take-off and vertical landing (STOVL) examples, and four each in the conventional take-off and landing and carrier variant models. Notable milestones for the programme last year included the completion of its 11-year-long system development and demonstration phase, during which some 9,200 sorties were flown, totalling some 17,000 flight hours. Production deliveries passed the 300 mark in mid-year and the annual target was met despite the USAF briefly suspending its acceptance of new jets while a contractual dispute was resolved over repairing an exterior panel corrosion issue. The Italian navy, meanwhile, took delivery of its first F-35B from a final assembly and check-out line at Cameri air base (below). Operational highlights included two air-to-surface combat debuts in the Middle East region, respectively involving the Israeli air force's F-35I "Adir" fleet and the USMC's F-35B. In Europe, the Italian air force's December declaration of initial operational capability status with its A-model jets was swiftly followed by the Royal Air Force's 617 Sqn achieving the same milestone with its STOVL examples. This followed more UK success, during initial landing trials conducted aboard the Royal Navy aircraft carrier HMSQueen Elizabeth. The Royal Australian Air Force's 3 Sqn also received the nation's first operational F-35As, at its Williamtown base in New South Wales. Some gloss was removed from these successes, however, when the USMC lost an F-35B during a training flight staged from MCAS Beaufort, in South Carolina - the first crash involving a Lighting II. Another cause of programme headwinds stemmed from strained relations between the USA and international partner Turkey, which could see Washington DC block the transfer of F-35As to the nation over its planned purchase of advanced surface-to-air missile systems from Russia. Training is, however, still being provided to Turkish pilots and maintainers at Luke AFB, in Arizona. Regarding future business prospects, Belgium has commenced discussions linked to a potential acquisition of 34 F-35As, having selected the type instead of the Eurofighter Typhoon. The Netherlands is eyeing an increased acquisition, which would boost its eventual fleet size by 15 aircraft, to 52. Japan, meanwhile, has indicated that it could purchase up to another 105 F-35s to meet its future fighter requirements, on top of the 42 to which it has already committed. Lockheed also appears to be edging closer to agreeing a multi-year contract arrangement with the US Department of Defense, which would support a key programme objective on price reduction. The unit cost for an F-35A in the most recent round of production was $89.2 million, and the company says the programme is "on track to deliver an $80 million" aircraft during lot 14 of low-rate initial production during 2020. Worth an estimated $22.7 billion, a multi-year deal covering 255 aircraft is now being discussed with the DoD. This proposed total would include 106 for the US services, plus 89 for international partners and 60 for FMS buyers. Some graphics showing the number of F-35s manufactured per year and those delivered and in service. A great insight to the F-35B from a serving RAF pilot who has enough experience to be taken seriously. Some interesting information contained within, especially in the context of the differences between the F-35B that Williams has flown compared to the A model (reduced fuel, lower G restrictions, increased weight etc). Also interesting that the UK has yet to acquire any of the GAU-22 gun pods for the aircraft. Mind if I cut and paste this to the Germany Considers Tornado Replacement Thread? According to the article, it's too expensive to build airframes at such low volume. Lockheed Martin can sell them to Japan for much less and likely deliver them faster. This news is still gaining momentum so someone must be pushing it. I'd say it is basically click bait reporting now. It appears that everyone is just rehashing the defensenews article into a whole slew of circular reporting. Flight's article says japan is still considering the decision to manufacture domestically or not but from what I linked earlier that decision has already been made and that information released over a month ago. F-16 production in Fort Worth peaked @ 30 per month in 1987, I believe (this excludes Dutch/Belgian/Turkish/other assemblies). The F-35 would...have a ways to go to match that. The continuing debate on Australia and the F-35b off the LHDs. A whole bunch of reporting on Sinapore's announced acquisition. Only defense analysts can get depressed over a victory. This week the Singaporean Ministry of Defense and the Republic of Singapore Air Force (RSAF) finally ended their long, coquettish courtship with Lockheed Martin and pulled the trigger on buying the F-35 Joint Strike Fighter (JSF). What’s Behind Singapore’s F-35 Fighter Jet Decision? On January 18, as expected, Singapore announced that after years of consideration, it had selected the F-35 as the best option for it to replace its current aging F-16 fighter jets. The decision has once again drawn attention to the city-state’s longstanding efforts to modernize its air force capabilities, even as it has left the specifics unclear about how it will proceed in the coming years. Some of our readers asked us to investigate the story behind an F-35 mock-up painted in arctic color scheme, located at Lockheed Martin’s Forth Worth, after the mysterious model was featured on the reputable F-16.net forum. The mock-up has been sitting in a LM yard, from at least Apr. 2012 to December 2018, when it was moved (the aircraft can still be seen in the latest imagery). Since 2012, photos taken from space show the F-35 model in different locations, along with other test articles and mock-ups, including the X-35 and A-12. “There aren’t a lot of photos / points in time when the yard was shot from space, but on Jan 2016, Jan 2017 and Feb 2017 it’s also missing from the yard (there are no photos between those 3 times though, so it might have been gone for 13+ months, or it might have just been gone the days, weeks or months that those photos were taken),” says user Dragon029, who also pointed us to the somehow mysterious aircraft. In this thread you can see all the satellite images Dragon029 has collected: they show all the locations the F-35 mock-up has been in the last 7 years. That article wasn't an analysis as much as an arguement. Something objective would be more interesting. ASPI is very much as the name describes a policy think tank and can certainly lean to the argument side. There is a whole bunch of additional material on Australia and the consideration of F-35B off the LHDnot from ASPI so let me know if you are interested and I can provide the links. Some good sources and assessments and some questionable but worth reading anyway. Thought I would post this here given the F-35 is the prime candidate to benefit from CUDA should it go into production. Lots of value in a weapon like this on a stealth platform as well as how the combinations may play to the advantage of mission planning. It is being sized to allow for two missiles to replace a single AMRAAM on the A2A door station and four missiles on the A2G station of each bay. That would bring the loadout to a very respectable 12 AAMs internally while preserving a full stealth configuration with minimal drag. Additionally you could see configs such as 8 SDB II and 4 CUDA AAMs or 8 CUDA AAMs internal and a Meteor AAM on each bay door. I doubt the F-35 will reach that many per year, unless something unfortunate happens and production has to rise significantly. Per here, http://www.f-16.net/fleet-reports_article18.html the highest year of delivery for the F-16 was 286 as you suggest in 1987. That is approx 24 a month, and probably a little higher when you include shutdown periods, which was very impressive. No surprise the Canadian Government continues to hedge its bets and stay in the program, if only to protect the significant number of jobs and money flowing in from F-35 industrial participation. How is this possible though? With similar tech in the full length AMRAAM size it will always fly much further. I do however like the idea of having four 80-100nm D AMRAAMs on the main bay pylons and four 50-60nm half-raam CUDA missile on the door. I think the USAF should get rid of the AMRAAM altogether and go with the SLAMRAAM-ER which would actually be easier to fit two on the main pylon and would be easy to integrate as it has the same seeker as the current AMRAAM. This would make a 150nm anti-awac duty missile and then have four Cuda's for fighters on the bay doors. For those interested an insight into the demo the USAF will run this year with the F-35. Not sure how they are getting the range figures. I imagine it isn't compared to an AIM-120D though, more likely the shorter ranged C-5/7. The missile has no warhead so perhaps increases range by using that space and weight for propellant as well as an optimised flight profile for long range intercepts. The USAF is clearly looking at increasing missile loads as well as new missiles to equip their 5th gen aircraft. I like the idea of a SLAMRAAM-ER but perhaps as the missile for an arsenal aircraft or loaded on the F-15/Super Hornet "missile trucks" that people reference. Use the 5th gens closer to the fight to identify the targets and lob the longer ranged missiles from further away with hand off to 5th gen aircraft for mid course and final engagement. That would be great. You often need to compile your own objective database by reading opposing arguments. I was literally just going to post this today, I had some friends in our Warbird organization go to ICAS this year to sort out our air show schedule, and they mentioned running into "Dojo" and the buzz surrounding the 2019 air show Demo Team. We got a hint of this with the F-35 performance at RIAT towards the very end of last year (many videos). I think they had just received a Block 3F aircraft and were playing around a bit. The practice videos of "Dojo" figuring out and perfecting maneuvers for the first official F-35 demo season are nothing short of spectacular - again, this has to be possible only now, due to the 9g capability of the latest software. THIS IS THE YEAR that all the nay-sayers immediately shut up while looking like complete fools. Sure, it's still an expensive platform, but maneuverability and performance questions will be instantly silenced. So true that THIS IS THE YEAR, probably 2 to 3 years ago there always was talk that the F-35 couldn't perform etc. For the last year it seems that the F-35 became THE CHOICE for the best fighter. Quite interesting to see. ASPI is very much as the name describes a policy think tank and can certainly lean to the argument side. There is a whole bunch of additional material on Australia and the consideration of F-35B off the LHD not from ASPI so let me know if you are interested and I can provide the links. Some good sources and assessments and some questionable but worth reading anyway. I don't think the question is whether the F-35B is a great capability to have. It is more about whether it is worth having in small doses, the cost to acquire and what RAAF assets it would come at the expense of. Speaking of cost how much cost,rcs reduction and time were involved moving the 35 from a 7 to 9 g ac? In your opinion was it a good trade? The F-35A builds on the F-16's 9G 25 AoA capability. The F-35B has a reduced G load compared to the AV-8B (8G I believe) but has significantly better AoA and bring back capability, sensors, payload, range etc. The F-35C is very close to the Super Hornet, also a 7.5G airframe, but the Super Hornet likely has a higher AoA with a lower range, fuel load and overall payload. There probably isn't any specific reason the Bee and Cee have lower G ratings other than the additional weight of the STOVL and CV equipment respectively and the USN and USMC/RN didn't require greater capability. Higher G would likely have required more internal reinforcement for probably little overall benefit and higher cost. As for overall good trade, yes. The USMC and USN didn't require that higher G level, especially in an era of HOBS missiles and HMS and a stealth platform that will dominate BVR combat. Ozair covered this really well already, but I just need to drive home the fact that Lockheed designed these aircraft from the ground up to do exactly what "Dojo" was doing in that video; they just had to wait nearly 10 years to actually see it happen. It's purely software; flight controls and envelope expansion, verification, and probably lots of safety checks/tests/programming as well. I think that's why there's so much excitement in the airshow community (let's face it, most F-35 operators already knew the planes COULD do this stuff). It also has to be incredibly rewarding for the LM folks to watch the bird really "fly free" so-to-speak, for the first time. Seriously - for those who haven't yet, WATCH THE 2019 F-35 DEMO PRACTICE VIDEOS. How are those G limits figured? At GTOW, some standard fuel/payload configuration or something else? Guys, thanks for the detailed explanation. Usually at 50% fuel with a standard AAM load, (which gives a typical total weight) and at various altitudes. EM diagrams are typically the way that turn rates, lift limits and Ps are explained. An example of a comparative analysis for the F-4J and A-4M. The lift limit for the respective aircraft show their max G at the respective loads and altitude. 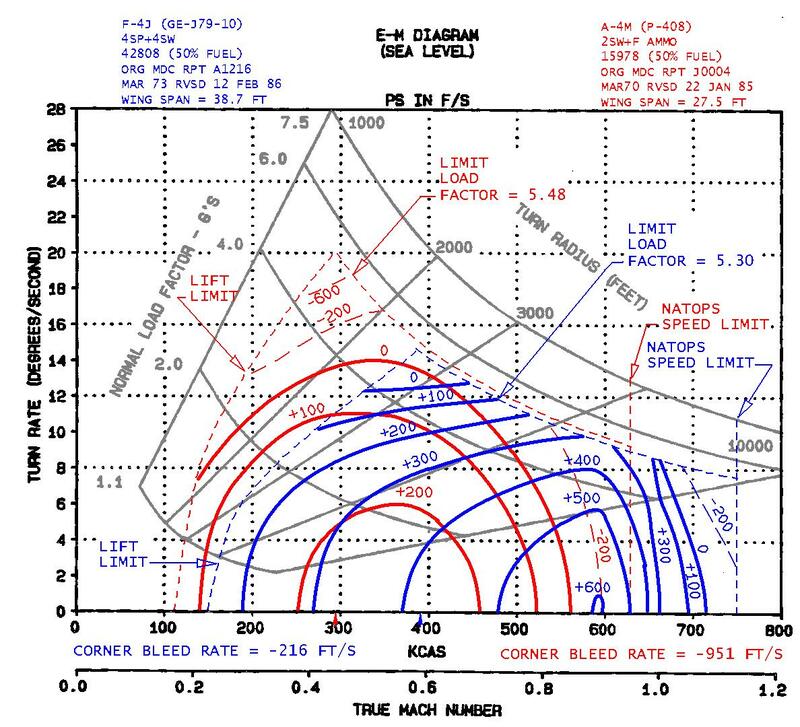 The peak of the lift limit curve is the max instantaneous turn rate, A-4M is approx 20 deg while the F-4J is approx 14 deg, while the sustained turn rate is taken from the solid red and blue lines which are the Ps. At zero the aircraft neither gains or loses speed. The figures are approx 14 deg for the A-4M and 12 and a bit for the F-4J. It is usually hard to find EM diagrams as it outlines the capability of the aircraft so typically classified. Some examples of the F-16 which shows how the lift limit and turn rates change with altitude. Cool stuff. I assume if you exceed the limits a stall ensues?... or worse? Obviously on the slow side yes, at the higher side it depends on the aircraft. Many current fighter aircraft have G limiters so the FCS won't let the aircraft push past the limits. The aircraft could probably quite comfortably go to more G than the limit but that necessitates structural inspections etc that ground crew don't want to do and creates long term fatigue issues. It also usually results in blackout or G-LOC for the pilot. As for what happens when you try and push past the lift limit not really sure other than insufficient lift to sustain the G load. If in an instantaneous turn then the aircraft is shedding speed so moves along or below its lift limit, for a sustained turn the aircraft remains stable at that G level (with that optimal sustained turn rate usually below the lift limit, especially at altitude). 412th Test Wing Public Affairs has reported that team of testers from Edwards Air Force Base linked up with representatives from Lockheed Martin company to go over crash recovery procedures for the F-35 Lightning II aircraft. According to a report, members from the 412th Maintenance Squadron performed the actual procedures on the aircraft for what is referred to as crash, damage, disabled aircraft recovery, or CDDAR. Different methods were verified such as using an aircraft sling attached to the F-35 to be lifted by a crane; “belly bands” that can be placed underneath the jet and attached to a crane; and inflatable airbags or lifting bags that can be used to raise a crashed or disabled F-35. IT related support services contract to the F-35 JPO including cyber security work. UK F-35B testing continues with the firing of ASRAAM off the US west coast. @17SqnRAF F35B “plugged into” a RAF Voyager tanker from @RAFBrizeNorton prior to heading into the Point Mugu Test Ranges on the west coast of USA, to conduct missile test firings - the first ASRAAMs fired from a UK F35B. All very successful. Well done @17SqnRAF. Thanks, one more question, based the graphs above stall speed for the ac look to be about .2 Mach. Assuming this is accurate can I conclude that in the air show video that started us off discussing g limits,the ac is in a stall condition at several points? From my little understanding part of what happens in a stall is that pilot’s ability to maneuver is severely constrained so what is the combat utility to any of this especially in a F35 w extremely low rcs and great situational awareness instrumentation. Am I missing something? That's a great compilation. Takes a while to get through. There does seem to be some pretty strong opposition to the 35Bs on LHDs other than technical hinted at. Little to no combat utility for the very slow speed post stall characteristics of the flight envelope. It is a consequence of aircraft that have high AoA capability and good thrust. The high AoA is incredibly useful in combat especially with HOBS missiles and HMS. WVR combat has moved from high sustained turn rates to high instantaneous turn rates with rapid energy recovery and aforementioned HOBS missiles. Probably a lot of opposition from the RAAF from the Australian perspective and as mentioned some questions on the utility of such a small number of aircraft. It will be interesting to hear how the F-35 performs now a couple of years later. I'd less interested in the kill ratios and more interested in overall performance, sortie generation and how the aircraft assisted the overall battle space picture. Have always figured there will be a ton of awkwardness among Eurofighter nations operating both types when the F-35 is wiping the floor with what most still claim is their main air to air fighter. It’s not controversial for the USAF or USN to state this. But for the ones building a competing product things may get uncomfortable. Speculation: range calculations necessarily include energy requirements for terminal phase high-g maneuvers to intercept the target. By including the DACS motors from PAC-3 for end-game maneuvers, less energy is needed at the terminal phase to ensure an intercept, so less rocket motor is needed to provide the same range. Also a drastically smaller warhead as you use hit to kill approach and have a very small lethality enhancing charge inside. So you are accelerating a significantly lighter weapon. I agree you won’t get the same performance as an AMRAAM length weapon with the same tech (hit to kill warhead, divertless ect) but that is really the question. It’s can we get a weapon that is useful across 80% of the engagement envelope of a current AMRAMM sand fit two of them in the same space. That seems possible. I don’t frankly see a lot of use for weapons that reach further than the AIM-120D in broad service. And you always have the option to carry a handful of long spears in revamped AIM-120’s if you wanted to range extend it (or Meteor I suppose) while also carrying a complement of these shorter ranges weapons. A configuration of say three AIM-120 and 4 small missiles would be very possible. Or two and 8. Or two, 4 and 4 small bombs. More blk 4 changes coming as the platform continues to evolve. More discussion and suggestion from ASPI on the Australian Defence Force operating the F-35 from their LHDs. The Australian Defence Force’s equipment is good and getting better. But the ADF’s current and planned force structures have some significant limitations in their ability to deliver some crucial military effects. In an era of strategic uncertainty, both in the threats we will face and in the capacity of our allies to help us face them, it’s useful to think about ways to address those limitations sooner rather than later. As always, the perfect (particularly when delivered sometime off in the never-never) is the enemy of the good. Also, given the strategic uncertainty, a future government will need to increase defence spending, or at least realise that its current investment plan needs some serious reviewing. So what are those limitations? First, we are acquiring the conventional ‘A’ variant of the best tactical aircraft in the world, the F-35 joint strike fighter. But its range is limited even with air-to-air refuelling, particularly if we want a sustained presence in an area, rather than one that involves flying out, launching munitions and flying home. Once a naval or amphibious taskforce is more than 1,000 nautical miles (1,852 kilometres) away from our air bases, it’s pretty much on its own. A thousand nautical miles isn’t very far in the Indo-Pacific, or even in our patch of it in the South Pacific. Second, our amphibious taskforce has only limited ability to provide fire support to lodged land forces. The short range of naval gunfire means that ships have to get close to enemy defences, leaving them vulnerable to the land-based anti-ship missiles we ourselves are interested in acquiring. The navy’s landing helicopter docks, Canberra and Adelaide, can carry the armed Tiger helicopter, but experience in Afghanistan and the Middle East shows that even relatively unsophisticated adversaries can make life very difficult for helicopters. Third, our fleet has a very limited long-range land-strike capability. The Harpoon missile has some ability to strike land targets, but even our air warfare destroyers can carry only eight of them. We could put a true long-range strike weapon on one of the AWDs, but it will always be competing with air defence missiles for a home in the ship’s vertical launch cells. The future frigate will have more cells, but the first ship won’t be operational until at least 2030 and then they’re scheduled to come only every two years. The future submarine is not being optimised for strategic strike. Fourth, our fleet has some ability to strike surface maritime targets. But Russian and Chinese anti-ship missiles have longer ranges than the Harpoon. The integrated investment program contains a project to acquire a more modern missile, but the number of vertical launch cells will always be a limitation, and ships can reload only back in Australia. Plus, if our missile can reach them, theirs can probably reach us. Submarines certainly have a serious anti-surface capability, but we’ve only got six of them and won’t get more for at least 15 years. Fifth, adversary aircraft armed with long-range anti-ship missiles can launch them from outside the range of our defensive missiles. Our fleet can try to shoot down missiles coming at it, but it can’t stop enemy aircraft from repeatedly launching, returning to base and rearming. All of this may not really matter if we’re confident that all we’ll need to do is plug into a US-led taskforce and rely on it to provide all of those missing elements. But if the challenge we’re now facing is that we may not be able to always and absolutely rely on the US to provide that support when we need it, then our force structure has a problem. All the effects outlined above can be delivered by the F-35: close air support; defensive and offensive counter-air; and maritime and (with the right missile) long-range land strike. The problem is we can’t necessarily deliver the F-35 to where we need it. How do we get the F-35, with its sensor suite, its data-sharing capability and its weapons load, into the fight—and, by doing so, allow the rest of the ADF to fight where we need it to? One approach would be to get access to more airbases. But there aren’t many airbases capable of supporting the F-35 in our immediate region, and we’d always be reliant on host-nation support. Operating from an established land base also means the adversary knows where you are and, with the help of a spotter with a mobile phone sitting by the airbase, when you’re coming. You know where this is going. Put the F-35 on a ship. But that’s only part of it. The suggestion is to acquire a squadron of the short take-off and vertical landing variant of the JSF, the F-35B, and a third LHD optimised to support air operations. What does that give the ADF? The bottom line is, a lot more options that the adversary has to deal with. Even in an age of space surveillance and electronic warfare, it’s harder to deal with an enemy airbase that’s moving. Moreover, the F-35B doesn’t need to operate from a ship and can use a lot more airfields than the conventional JSF. It will be interesting to see where the resourceful US Marine Corps takes its F-35B as it learns to operate it. Is a Swedish approach, of operating from highways, on the cards? I’m well aware of the threats posed by Chinese anti-access capabilities, and I’m not suggesting that having F-35Bs will mean that the ADF can go up against the Chinese fleet alone in the South China Sea. But I can’t see how a maritime or amphibious taskforce that includes an LHD with an F-35B is somehow more vulnerable than one without it. And if it’s too dangerous to send an F-35B–equipped LHD to sea, then it’s certainly too dangerous to send an LHD without the F-35B but with over 1,000 troops on it to sea. Moreover, the F-35B, whether operating from land or from an LHD, gives a lot of capability in scenarios short of full-scale war against China. A dozen F-35Bs flying two sorties a day, each with 24 guided 250-pound bombs on board, would provide a lot of close air support in an insurgency situation like that which unfolded in the Philippine city of Marawi, for example. And in terms of options, if we’re in a scenario where we’re mainly concerned with a submarine threat, the third LHD could operate as an anti-submarine helicopter carrier and at the same time retain much of its original amphibious capability. There are certainly other options Australia could consider, but it’s hard to think of alternatives that are available now. The new US bomber, the B-21 Raider, will provide a lot of the effects described above when it enters service, but it’s likely to cost around A$1 billion per aircraft. Unmanned combat aerial vehicles are coming, but they can’t do the whole job yet. A third Spanish-built LHD and F-35B squadron could be delivered in around five years (even with the modifications that allow it to carry all of those munitions and aviation fuel), well before the navy’s new frigates and submarines arrive. Yes, the F-35B has a shorter range and a lower payload than the conventional variant the RAAF is already getting. But it has exactly the same sensor suite, sensor fusion and data-sharing ability. These make every asset in a taskforce better. When you really get down to it, the question is, would we prefer to have an F-35 with slightly less capability in the fight, or no F-35 and potentially no ADF in the fight at all?